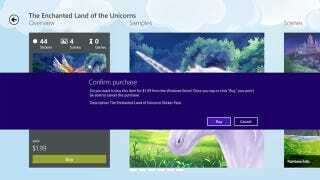 Microsoft has released the details on how they plan to run the apps released through the new App Store coming with Windows 8. We have known about the store for a long time, but this is the first time we've heard about the inner workings of the apps, like the cut Microsoft plans to take. First and foremost, all paid apps will cost at least $1.49 as opposed to the $0.99 other platforms allow. And most importantly for consumers, Microsoft plans to implement a 7-day "try before you buy" setup with apps that will let you opt-out of the full purchase if you don't like it.